The Khurul Lake in Lhamoidzingkha in Dagana that was about to dry up five years ago is now almost filled to the brim with fresh water. Almost 90 percent of the drying lake has been revived with restoration works carried out by Lhamoidzingkha Dungkhag Administration. The lake is located some 10kms away from Lhamoidzingkha town. The Dungkhag carried out the maintenance works around the lake despite the initial resistance from the people. People believe that any disturbance around the lake could enrage the residing deity and cause natural calamities. 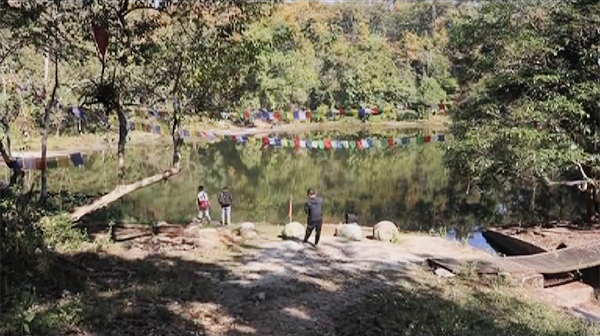 Lhamoidzingkha Drungpa, Tashi Gyeltshen, said that firstly walls were built to prevent debris from entering the lake during the monsoon. “Secondly we made a seal below the lake to check the outflow of water from the lake. With such works in the area we were able to retrieve the lake,” he said. People also believe that the lake is a wish-fulfilling lake and a lot of them frequent the lake. The lake is believed to be hundreds of years old. According to folklores, oysters were sighted at the lake and therefore the name of the lake is ‘Khurul’ which means Oyster in Lhhotshamkha.